Play time for toddlers is very important as it is a time for both relaxation and learning. It is essential to have toys on hand that combine both play and learning. Train sets enhance your child’s creativity as they learn how to assemble the train and put the pieces in the right places. This is why you need to consider the best train set for toddlers. Children also learn valuable lessons in taking care of these train sets by learning where and how to store the different pieces of the sets as well as keeping it safe until the next play time. Train sets for toddlers give you a chance as the parent or caregiver to bond with your kids as you help them set up and play with their trains, making your interactions emotionally gratifying. Train sets are convenient play items and can be used just about anywhere without having to go out of your way to make the kids happy. The Go! Go! 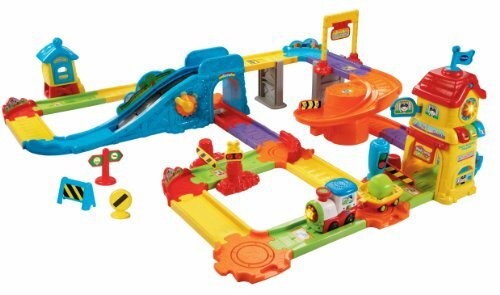 Smart Wheels Train Station by VTech is designed to combine building skills with fun to keep them engaged and away from mischief. This toddler train set includes a motorized train that plays sing-along songs and speaks at the 10 SmartPoints track locations which helps kids improve their language as they play. At the electronic train station, your kids can learn time, colors, and phrases in English and other languages. 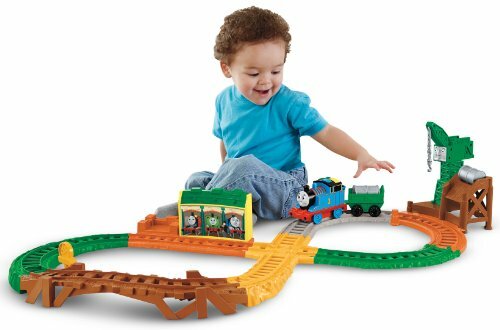 This set has interchangeable track pieces that kids can manipulate into different configurations for new tracks each day which will improve their creativity and keep the activities on the track interesting. The VTech Go! Go! Smart Wheels Train Station Playset is designed for toddlers between the ages of one and three. The set has a battery option included. Sing-along tunes helps keep playtime entertaining and improves language and speech skills. Can offer numerous design challenges improving on creativity and learning. Kids will need adult assistance to help assemble the train set. This train set offers a good challenge to toddlers, and it gives you a chance to play with your child as you teach them how to operate and put together different track designs. The price is very fair and you can let your toddler manipulate the set it in every way imaginable. This product, the VTech Smart Wheels, is one of the viable and the best train set for toddlers. To give you some visual enlightenment about what the product looks like – Here is short clip for you. The picture of the product may show a small set but this is actually quite large and could bring about a very long time of fun and entertainment. This train set features three different destinations for Thomas, each with an activity or friend. This set keeps play interesting by allowing your child to choose which of the destinations Thomas is headed to nest. The train set interacts with your toddler with more than 50 sounds and phrases. This set has easy-to-use controls which makes it more fun for your toddler as compared to more complex settings in more advanced train sets which can be frustrating for a toddler. All Around Sodor helps develop motor skills as your toddler handles and manipulates Thomas and his cargo during play. This set also feeds the child’s curiosity and learning with the choice of the different destinations and allows the child to participate in activities each destination. This set is priced at about $40.00 plus shipping on Amazon.com. Thomas works on and off the tracks. Thomas and the cargo car are motorized. The set is pre-loaded with numerous sounds and conversations that help kids improve their language skills. The track only has one configuration. Toddlers require constant engagement that is also diverse to keep them actively engaged or else they may seek other activities which could spell trouble. This set delivers a good range of activities that will help your kids learn and have fun at the same time. This is a good investment for your kids. 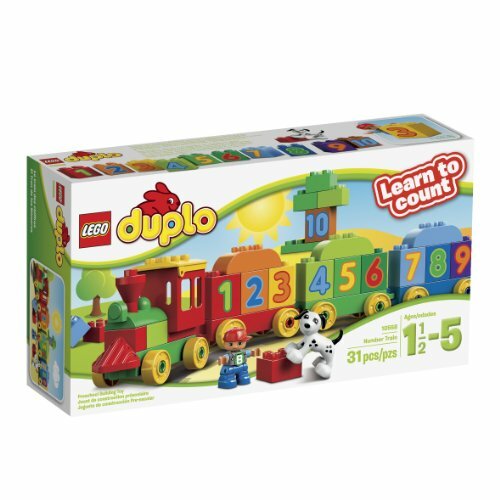 This train set is designed to help improve your child’s counting skills while playing with the numbered bricks and wagon bases among other friendly items that make up the Lego Duplo set. This set is more of a learning toy. You can be sure that your child will have loads of fun playing with the various items in the set. The set comes with numbered Lego Duplo bricks and three wagons, which engage your toddlers in building as they learn simple math skills while also having fun. This train set gives the option of rebuilding the set into a tunnel, a building, or even a dog house keeping your toddler engaged at all times while developing important skills. The Duplo My First Number Train Building Set is priced at about $20.00 with free shipping at Amazon.com. Fun and safe for young children. This Lego train set is good play set for young children with its combination of learning and fun. The pieces that make up the set are quite durable. It can handle being dropped and tossed around by young children without incurring any real damage. This would be a good investment. When it comes to the best train set for toddlers the Go! Go! Smart Wheels Train Station Playset carries the day based on the variety of activities it offers to your young children. However if you want a quality inexpensive train set then Thomas the Train: All Around Sodor will serve your child very well as it combines quality and economy in one package. The LEGO Duplo is the best train set for a very young child as it is quite simple to play with, and with your assistance the child is able to learn counting skills early on.